Heat oven to 400°F. Bake puff pastry shells as directed on package. Cool on cooling rack, removing and reserving tops. In 1-quart saucepan, heat milk to simmering; remove from heat. In medium bowl, beat egg yolks and 1/4 cup of the sugar with whisk. Sift cornstarch over mixture; beat with whisk until well blended. Stir in 1/2 cup warm milk. Slowly pour egg mixture into pan, stirring constantly. Heat to boiling over medium-high heat; cook and stir 4 to 5 minutes until thickened. Remove from heat; stir in vanilla and almond extract. Pour pudding into clean medium bowl; place plastic wrap directly on surface of pudding. Refrigerate 30 minutes. In large bowl, beat whipping cream and remaining 4 teaspoons sugar with electric mixer on high speed until stiff peaks form. Gently fold two-thirds of the whipped cream into pudding. Divide evenly among pastry shells. 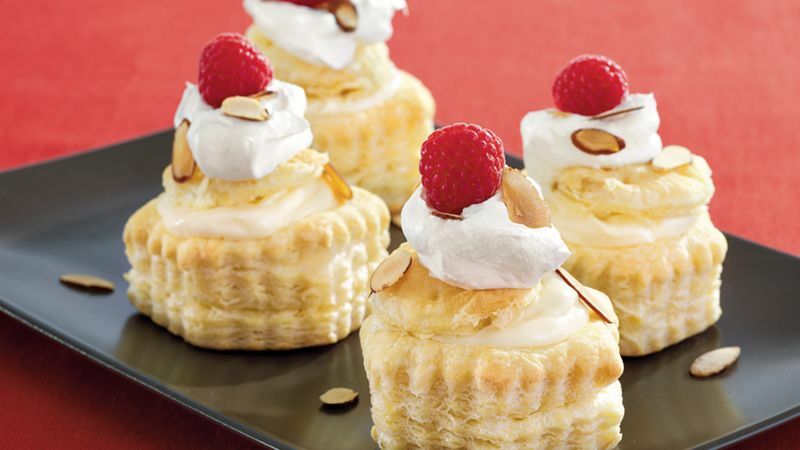 Replace pastry tops; dollop with remaining whipped cream. Top with almonds and raspberries.